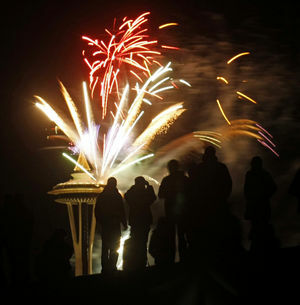 Greet 2013 Seattle-style at New Year’s at the Space Needle on Monday. One of the world’s largest structure-launched fireworks displays and a local tradition, the event draws big crowds to Seattle Center and viewing points around town, with a large audience for TV broadcasts. The Armory, formerly called Center House, was remodeled this year and renamed for the National Guard Armory it once was. Besides the eateries, there’s an all-ages dance with live music Monday night, and ice skating at Fisher Pavilion is open until 11:30 p.m., so there’s plenty to do while you’re waiting for the new year. The Space Needle Observation Deck and restaurants close at 6 p.m. Monday for private, sold-out events. Monorail service is suspended after the 11:15 p.m. run from Westlake Center on Monday until the fireworks show is over, then resumes until 1 a.m.
Tuesday, kick off the year boldly at the Polar Bear Plunge at Seattle’s Matthews Beach Park. Costumes are welcome at the festive event and everyone who submerges neck-deep in Lake Washington gets an Official Patch of Courage to commemorate their bravado. Both events are free. Happy 2013!